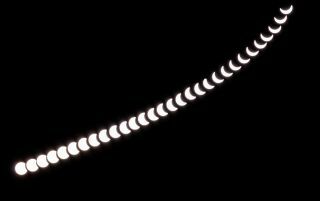 A string of photos shows a partial solar eclipse develop March 20, 2015. One of the biggest names in mathematical computing has built a new tool to help skywatchers prepare for the total solar eclipse of Aug. 21, and penned a deep dive into how eclipses have driven mathematics. Stephen Wolfram is the founder and CEO of the computation company Wolfram Research, which created the math programming language Mathematica and the browser-based problem-solver Wolfram Alpha. (He also consulted on the alien language and more for 2016's "Arrival.") The company's latest project, Wolfram Precision Eclipse Computation, is a simple window that takes in a location and puts out a detailed guide of what to expect on Aug. 21 — eclipse timing and what the sun will look like at every stage. Space.com talked with Wolfram about what he uncovered on his trek through eclipse history, how measuring the moon has driven science, and what to expect from the new eclipse website. Space.com: So this eclipse project inspired a deep dive into the history of totality for you, right? Stephen Wolfram: I had fun tracking down all this history. I knew a large fraction of this history, but I did not understand the thread of the whole progression of things. What I hadn't fully internalized is how central the problem of the moon was to science for a really long time. It was really through — after science woke up in the 1500s, the problem of the moon was almost a driving force for the developments in physics and mathematics and so on, right up through the end of the 1800s. For me, as a physicist, so to speak, coming of age in the 1970s, the problem of the moon seemed like it was solved. But it turned out it was really a dominant thing for such a long time. It's interesting because it involves so many of the key figures in the development of mathematical physics. It's also interesting that, in a sense … the planets and the moon were almost the thing that got exact science started, because that was the first set of observations that the Babylonians made that could be synthesized into something one might call a scientific theory. Space.com: And your blog post goes in detail through that history and how the mathematics and measurements evolved. One interesting point is that the ancient Antikythera mechanism — a calculating device well more than 2,000 years ago — actually had the capacity to predict eclipses. Wolfram: It's such a bizarre piece of history, because we only have this one example of a computing device from antiquity. It seems hard to believe that there was only one of them. It's also an interesting cautionary tale, as we look at ideas and developments that happen today — will any of these be lost in the same way that the Antikythera device was lost? Maybe what happened at the time [was] there was some particular group of people that was building things like the Antikythera device, and other people just didn't understand what they were doing, and so the whole thing never really took off and then was lost for 1600 years. A Wolfram Demonstration depicting the inner workings of the Antikythera device showing a possible eclipse when set to Aug. 21, 2017. Space.com: You call it "unsettling" in the post that it just disappeared like that. Wolfram: You would have expected that given that that level of advancement had been reached, that that tradition would somehow have survived. In the rest of this history, nothing goes backwards like that. Everything else just sort of sequentially builds. That's the one place where we really lost a lot of stuff. Space.com: Jumping forward, Newton's equations could describe the moon's orbit — so why didn't that solve the problem? Wolfram: When he tried to work out the theories of moon, he just couldn't do it, because the math is basically too hard. Newton had a very clunky way of doing calculus. He'd invented calculus, but he was still using these geometrical methods which were very inefficient … His theory, when correctly worked out, gets it right, but his actual calculation was not able to get it right. Newton had this lovely booklet that he published in 1702, this theory of moon booklet which gave a little rule-of-thumb algorithm for computing the position of the moon. People got really interested in computing the position of the moon because they wanted to solve the longitude problem… Given the formalism that Newton had defined, it was then basically 200 years of extremely serious work in mathematical physics aimed at solving the problem of the moon — to some extent, other planets as well, but the moon is much harder than the problems with other planets because the moon is truly a three-body problem. [In the] Earth-moon-sun system, there are significant gravitational effects between all those bodies. People were filling these hundreds and hundreds of pages with algebraic computation. Personally, that was the kind of thing that I wanted to avoid spending my life doing back when I was a kid, and that's why I started developing things that led to things like Mathematica and Wolfram Alpha. I don't want to be filling hundreds of pages with calculations I'm doing, I just want computers to do that stuff. That wasn't an option in 1800. Space.com: Eventually computers could do it, though, right? Wolfram: Originally the Apollo missions were using [English mathematician Ernest] Brown's tables — they were basically using a computerized version of Brown's tables from like 1918, tweaked a bit, to work out where the moon was going to be. That was good enough for that purpose. But then, NASA started out doing direct integration for the planets, which is an easier case than for the moon. The moon is a particularly nasty three-body problem. And then by the '80s, it's possible to do direct integration also for the moon, although assisted with a bunch of algebraic methods to preprocess the equations to make things easier. In this graphic, the Earth's movement around the sun over the course of a year is shown along with the moon's (exaggerated) movement around Earth. The moon appears red when it's close to the plane of the ecliptic, when it is in line with the sun and Earth. Eclipses can occur when the moon is in that plane and also on the innermost part of the diagram, between Earth and the sun. Space.com: Which — skipping over a lot — brings us to your new eclipse calculation website. Wolfram: A few weeks ago, we finally decided, let's do something interesting for this eclipse, and so we decided to actually build, using our technology stack, this website called precisioneclipse.com where you can basically type in a street address, and it should give you, to the second, when the eclipse will arrive. Space.com: To do that you had to very precisely map out where the user was, exactly what time it is — harder than you'd think, from the sound of it — the user's elevation and how the light would pass by the moon's irregular contours, you've said. Was it hard to incorporate all of that? Space.com: What separates your website from other eclipse calculators out there? Wolfram: The thing that will be really interesting, for the geek crowd, is what we are internally calling the "Geek Report," which is not quite ready. [It will] be a 20-page or more thing which gives information like the light curve predictions and all kinds of other details that come out of the calculation but are probably not of interest to the typical person, but since we're calculating them we might as well show them. I think that will be a lot of fun, and probably — certainly by Monday, that will be ready. Space.com: And come Monday, we'll see how precise it really is, right? Wolfram: I must admit, when you build software that has the feature that you're predicting something where you look out of the window and you see if the calculation is correct … I remember when we were first building things with Wolfram Alpha, you could do simple astronomy type stuff like position of the sun. I'm used to mostly building software where there's an internal computation that has some consistency or not. It's not something where you basically look out the window and see if it's correct. Space.com: Are you planning a similar personal test case with this eclipse? Wolfram: Of course. I'm going to Jackson, Wyoming. Space.com: And your calculations will fold into all of those from the Babylonians, through the Greeks, Newton and so on. Wolfram: I don't know of any other scientific epic that's been as long-running as the problem of the moon. It's a thread that goes through the whole history of exact science as it's developed — it's just invisible to us today because it was kind of solved 100 years ago. It's worth remembering. This was a driving force in a lot of what got done in exact science. We take it for granted now, but it's a heroic tale. This interview was edited for length. Try Wolfram's eclipse computation website here.